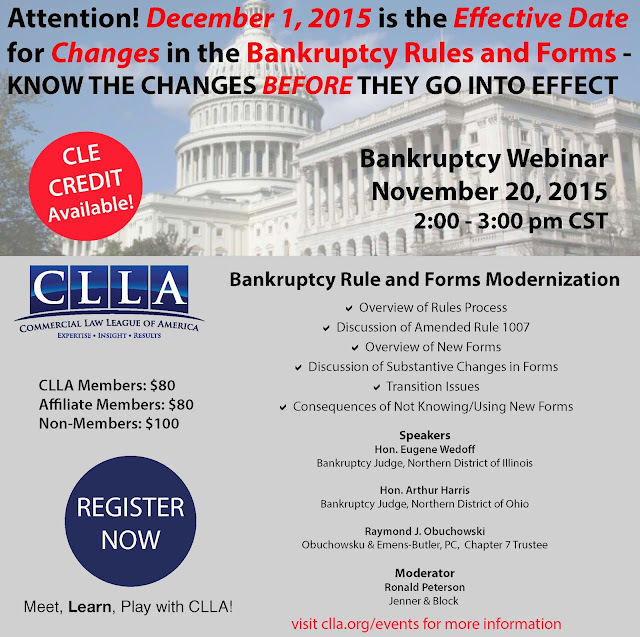 The Commercial Law League of America will present Changes in the Bankruptcy Rules and Forms–Know the Changes Before They Go Into Effect on November 20, 2015 from 2:00-3:00 pm CST. The webinar will feature Bankruptcy Judges Eugene Wedoff from the Northern District of Illinois and Arthur Harris from the Northern District of Ohio, who served on the Rules Committee, and Ray Obuchowski, who was the liason for the National Association of Bankruptcy Trustees to the Committee. The program will be moderated by Ronald Peterson from Jenner & Block. The program will explain the rules process, discuss Amended Rule 1007, provide an overview of the extensive changes to the forms, discuss the substantive changes to the forms, will discuss transition issues and explain the consequences of not knowing about or using the new forms. The new rule and forms go into effect on December 1, 2015 so that the webinar is very timely. This is an opportunity to learn about the rule and forms before they go into effect from the people involved in creating them. The cost of the webinar is $80 for CLLA members and members of affiliated groups and $100 for non-members. Registration information is available here.